FULL RESEARCH REPORT NOW AVAILABLE TO DOWNLOAD! 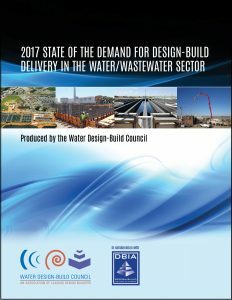 WDBC, with the endorsement of DBIA, released the first-ever research report on the use of design-build delivery in North America. This important product identifies the historic trends of growth in both size and number of design-build water/wastewater projects from 2013 through 2017. It also forecasts potential capital outlays on design-build for water and wastewater projects through 2021. Top water/wastewater design-build markets are highlighted as well as how cost, risk, and delivery time drivers affect the future of design-build for water and wastewater projects. In 2015 the WDBC concluded the final phase of its customer survey series with a research report, of project managers and agency/utility executives identifying the core lessons they’ve learned through their experiences with design-build delivery methods. From these experiences, they offer important recommendations for others to use to achieve successful design-build projects, from inception to transition. More importantly, the managers emphasized the value of education—including peer-to-peer interaction and familiarity with best practices—with actions that can improve the education process for practitioners at every level. As a follow-up to the 2012 Customer Satisfaction Survey, the WDBC, funded a second tier of research to ascertain the type of and level of impediments owners have or encounter in using collaborative delivery methods for water and wastewater infrastructure projects. From this research, the survey participants (representing utilities and municipalities) revealed the numerous impediments they often encounter in being able to use collaborative delivery methods within their organizations and jurisdictions. They reported that these impediments were the result of varying situations that exist within the regulatory environment, governance structures, and the public policy decision-making process. In addition, participants also expressed a desire to learn how to overcome these impediments in order to pursue the use of collaborative delivery methods — and to help others do so as well. Smooth transition of the constructed project to operation. The vast majority of municipalities (within North America) are satisfied with their use of design-build (DB) and construction management-at-risk (CMAR) project delivery methods; and, nearly all plan to use these methods again for future water and wastewater projects. This research study, commissioned by the Maryland-based Water Design-Build Council, a part of a series geared to developing the needed education materials to achieve successful projects. 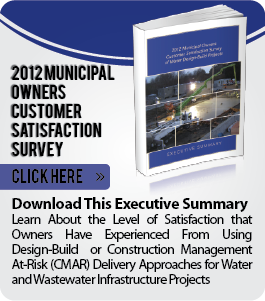 The 2012 Municipal Owners Satisfaction Survey gauged the level of satisfaction that owners have experienced from using design-build or CMAR delivery approaches for water and wastewater infrastructure projects, who were primarily managers and members of the project staff of local and regional governmental units (such as utilities, municipalities, and water/wastewater districts), as well as a few policy-makers.